A lot of my clients have never contracted professional artwork before and are a little unsure what to expect or how to approach it. While I certainly can’t speak for other designers, here’s how it works for me. Drop me a line via email or my contact form. Briefly describe what type of work you need, for what purpose. Logo for business cards? T-shirt design? Brochures? Or maybe you’re not even sure what you need, but you know what you want to get out of it. Let me know! If you have a quick deadline, please let me know in advance. Sometimes I can turn projects around very fast, but not always. You should be happy with your art! Not getting it delivered in a timely fashion tends to make people unhappy, so I’d rather refer you to a trustworthy colleague than disappoint you with delays. I work best when I am able to chat with my clients in person or via Internet video call, so we’ll schedule a meeting. If you have any works in progress, sketches, ideas, or examples of things you love and hate, bring them to the table. We’ll just have a casual chat about your project, its competitors, and maybe whatever new show is on Netflix. Once we discuss the project, I’ll give you an estimate based on my hourly rate. You’ll probably find that it’s more affordable than you imagined! Half of the estimate is collected in advance and any remaining cost is upon completion of the work. There is no charge for the consultation unless we actually start working on the project right then and there. I’ll send you some rough sketches and ideas to make sure we are on the same page. Once you’ve approved the concept, I’ll clean it up and return to you for another approval. You might get a couple variations at first to help develop your design. 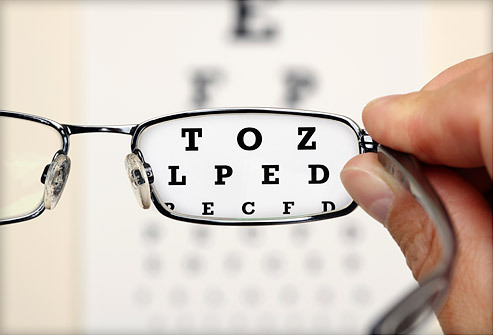 I usually say it’s a little like going to the eye doctor’s office. “Which looks better – A or B? B or C?” When things start coming come into focus, we can start fine-tuning. Upon finalization, I’ll send an invoice detailing the hours spent and any costs incurred, such as custom fonts or clip art purchased. If you’re billed for these items, I’ll include them with your final file package. Any remaining balance must be paid before I send files. Once you have paid in full, rights are transferred to you. The work is yours to keep or change at will. In our first meetup, I will have determined whether I should deliver the original files for you to use, upload to your site, or directly send them off to a print shop for production. Most branding packages include the vector graphics in Illustrator/PDF format as well as a set of raster images. (If you don’t know the difference between vector and raster, check out the video below.)  I don’t normally do SVG format unless requested, so please do let me know. I’ll also include a style sheet which shows a thumbnail image of each variation of the logo, lists the colors and fonts used, and recommended usage of each logo style. 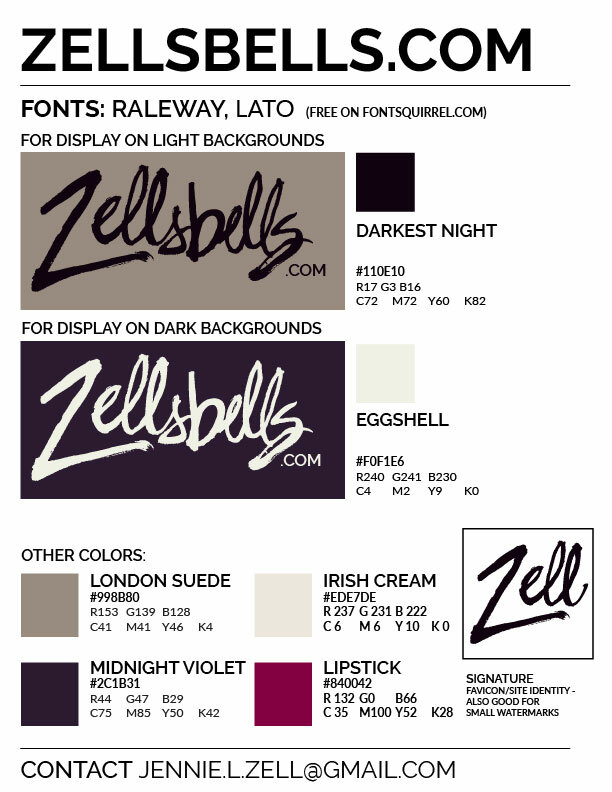 Here’s my Zellsbells.com script and colors in a sample style sheet. Your files will be uploaded to Dropbox where it will remain for at least a month. I highly recommend that you download all files immediately, so that you always have what you need! From print to online presence, I can help with all of your graphics needs. Drop me a line today and let’s get started!